These 1-1/4 in. overlay hinges offer six way adjustability. Perfect for replacements or new cabinet construction, this hinge fits many current face frame cabinets. Sold in pairs for better look and fit. Complement the interior accents of your kitchen or bathroom with these elegant Antique English Self-Closing 1/2 inch Overlay Semi-Wrap Hinges from Liberty. These traditional hinges feature a trend forward finish that provide the finishing touches for your complete room makeover. 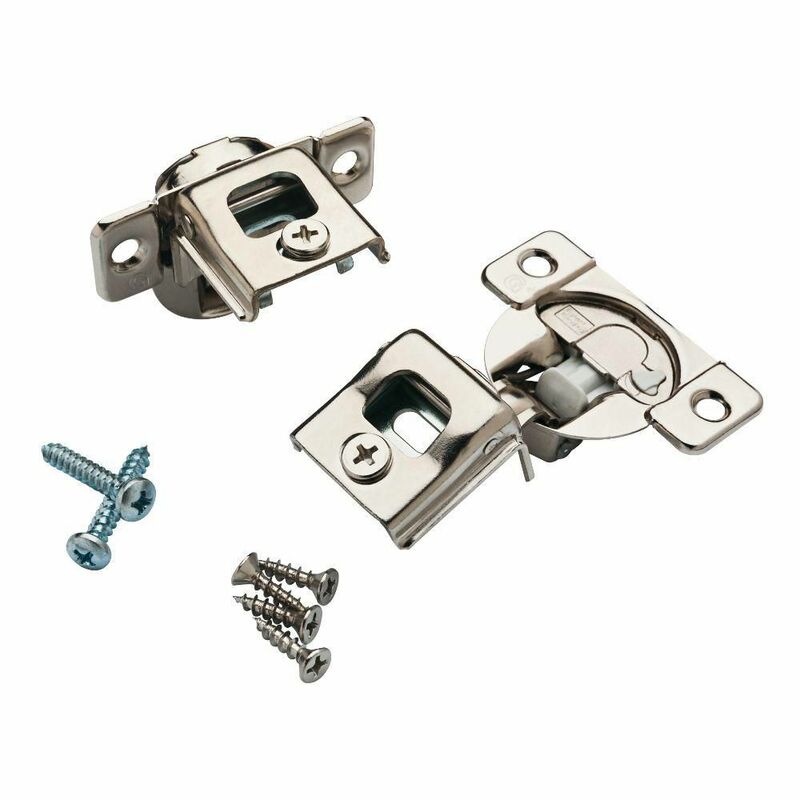 The use of common decorative hinge hole patterns allow for easy installation. The Liberty Satin Nickel Semiwrap Overlay Hinge is made from sturdy steel material and requires little to no force for cabinet door closure. This full overlay hinge conveniently has a self-closing feature for your cabinet and vanity mounting projects. Made from steel with a brushed nickel finish. Complement the interior accents of your kitchen or bathroom with these elegant Heirloom Silver Self-Closing Overlay Hinges from Liberty. These traditional hinges feature a trend forward finish that provide the finishing touches for your complete room makeover. The use of common decorative hinge hole patterns allow for easy installation. 1 1/4 INCH inch CLOSE HINGE 35MM 105 DEG These 1-1/4 in. overlay hinges offer six way adjustability. Perfect for replacements or new cabinet construction, this hinge fits many current face frame cabinets. Sold in pairs for better look and fit. 1 1/4 INCH inch CLOSE HINGE 35MM 105 DEG is rated 4.1 out of 5 by 14. Rated 5 out of 5 by Glenn from Product works as advertised. ... Product works as advertised. Rated 4 out of 5 by cs from the product was easy to install and works well. one package was sealed yet it was missing the ba... the product was easy to install and works well. one package was sealed yet it was missing the bag of screws. Rated 5 out of 5 by Paul from They worked perfectly! I had 17 cabinet doors that I... They worked perfectly! I had 17 cabinet doors that I upgraded from standard hinge to this self-closing version and it took me just over an hour to replace all of them. Rated 4 out of 5 by Keetur from Good replacement for builders grade Grass hinges When the original hinge broke, I tried to find the original manufacturer, and was hard pressed identifying the correct fitting. Part numbers had changed, and eventually other things became more important. One year later I was looking at the open space and said, "today is the day". Went to HD and saw that they had hinges, and then remembered I had to do a measurement. Head slap, back home I went. Got online, figured out the overhang, and head back to the Depot. Found the soft closing model in a two pack, pulled it out, and wouldn't you know, taped to the security tag, it says "Grass". Installed them, no adjustment necessary. Kitchen no longer looks redneck.